Did you know that one in every 133 Canadians suffers from Celiac Disease and 71% of Canadians are searching out gluten free options at the grocery store? We seem to be hearing more and more about people that have intolerances and food allergies everyday.It's in magazine articles and you see it in the grocery stores: gluten free, lactose free, nut free, etc..My girls can eat anything, but Gerry and I aren't so lucky. I'm sure I may have lactose intolerance and always have to be careful with what I eat.I even have used the gluten free products with many of our reviews just because I feel it's good to eat healthier as we are so sensitive to foods. 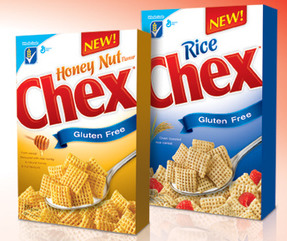 We recieved General Mills cereals- Honey Nut and Rice Chex Gluten Free Cereal to test. Both of us preferred the Honey Nut as it had a sweeter taste over the Rice Chex. Chex Gluten Free cereal can now be found in the cereal aisle and provides a flavourful option to breakfast, lunch, snack time and dinner, with great gluten free recipes to help you get back into eating again!